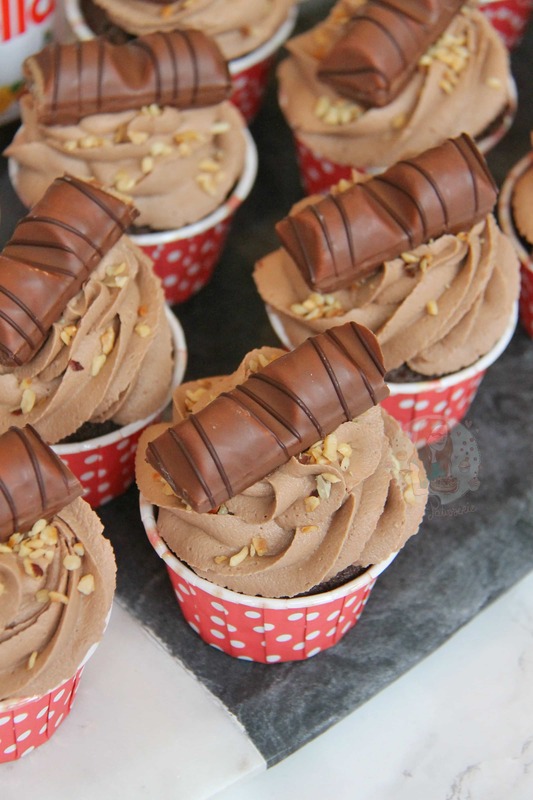 Chocolatey Cupcake dotted with Hazelnuts, topped with a Creamy & Delicious Nutella Buttercream Frosting with Kinder Bueno… Amazing Nutella Cupcakes! Some of you may also know that a little while ago I ventured to Italy with my Family, and Italy = Nutella in my mind. I had it EVERY day, at breakfast, in Gelato, and for pudding.. I am Nutella obsessed, which you can probably tell by looking at my Ferrero Rocher & Nutella No-Bake Cheesecake and my Ferrero Rocher & Nutella Chocolate Tart recipes! 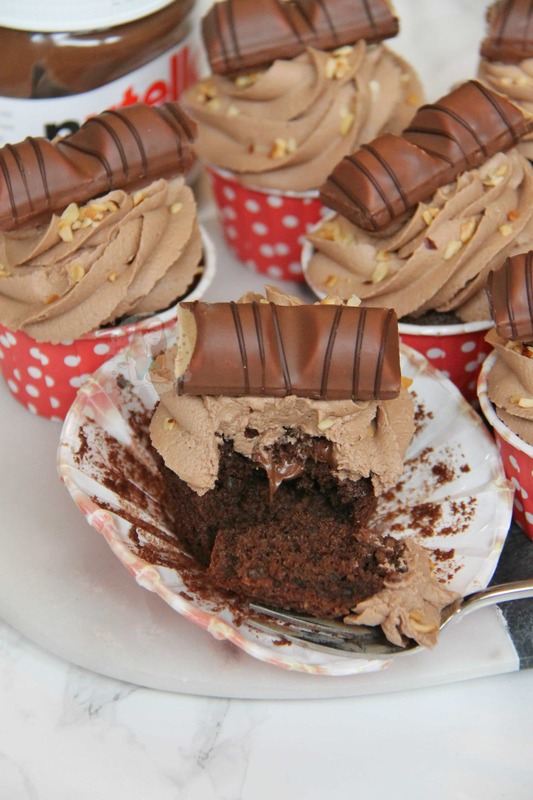 These have a delicious Chocolate Cupcake sponge with Hazelnuts to give an extra nutty taste. I then cut out a little bit of sponge to create a Nutella centre… hello yummy. 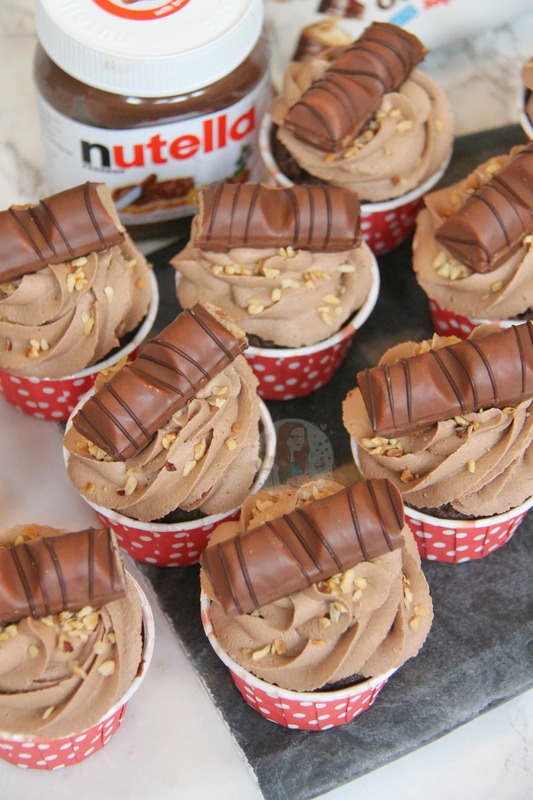 I then created a Nutella Buttercream to go on top, and topped that with some extra Hazelnuts and a piece of Kinder Bueno! Honestly, you can change this up if you wanted… like I wanted to use Ferrero Rocher, but damn they’re too pricey! I remade these cupcakes in August 2017 as the old recipe wasn’t my style any more. I wanted to make the recipe more simple, and even more delicious. I love using the Iced Jems Baking Cups for these as the colours are so bright, but you can use whatever you fancy! Swirling on the buttercream is just a little show.. you can just splodge it on if you wanted. I only ever put this much effort into baking when its for me blog, and usually there is a lot more mess in my kitchen, so I really do restrict myself haha! These are definitely for Nutella Fans, and Chocolate Fans, and even Cupcake Fans – they’re an all round winner in my house and with my taste testers so I hope you all like them too! 1) Preheat your oven to 170C/160CFan and Line a 12 Hole Muffin Tray with Large Cupcake Cases/Muffin Cases or put 12 Iced Jems Baking Cups onto a flat tray like I did! 2) Cream together the Butter and Sugar with an electric beater till smooth – add in the Hazelnuts, Beaten Eggs, Flour, and Cocoa Powder and beat again for about 30 seconds on a Medium Speed. 3) Spoon into your Cases and Bake in the oven for 18-20 minutes or until cooked through! Leave to cool on a wire rack. 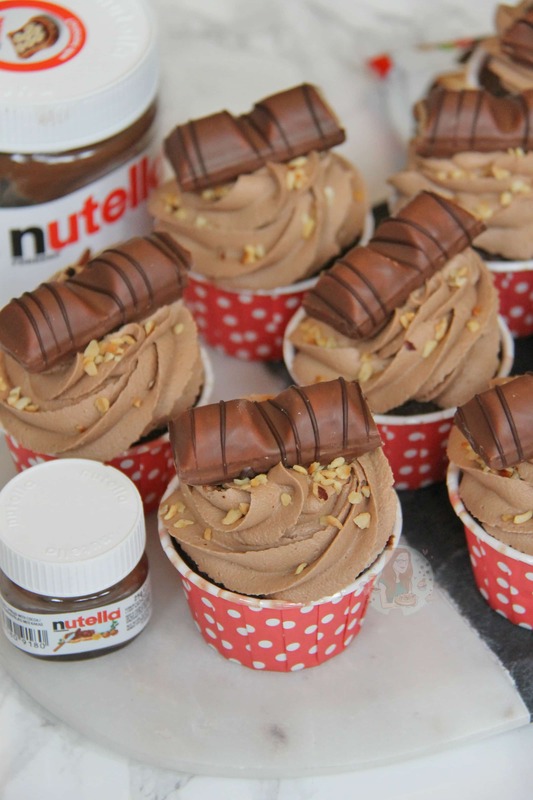 4) Once the cakes are cool, cut out a hole in the middle of the cupcakes and fill with nutella. 5) Now make the frosting – beat the butter till smooth and supple – add the icing sugar and beat again for a couple of minutes. Add in the Nutella, and beat again. 6) If its still or looking a bit weird, add 1-3tbsps of Boiling Water to loosen it slightly and smoothen it. I use my KitchenAid for Frostings as the machine can make it so much lighter and fluffier! 7) Decorate your cupcakes how you like – I use a 2D Closed Star Piping Tip, and swirl on my buttercream. I then sprinkle of some chopped hazelnuts, and a piece of Kinder Bueno! And ENJOY! These Cupcakes are delicious how they are – but you can miss out on the nuts in the sponge if you just want chocolate – or switch them out for a different nut! Just don’t go over 50g as I find that makes them dry! You can make your Frosting more Chocolatey if you like by adding 25g Cocoa Powder and only 275g Icing Sugar! Older Next post: Custard Cream Cupcakes! Newer Previous post: Cookie Cream Pie! Hi i was wondering can this be converted in to two 8inch cake tins? ? 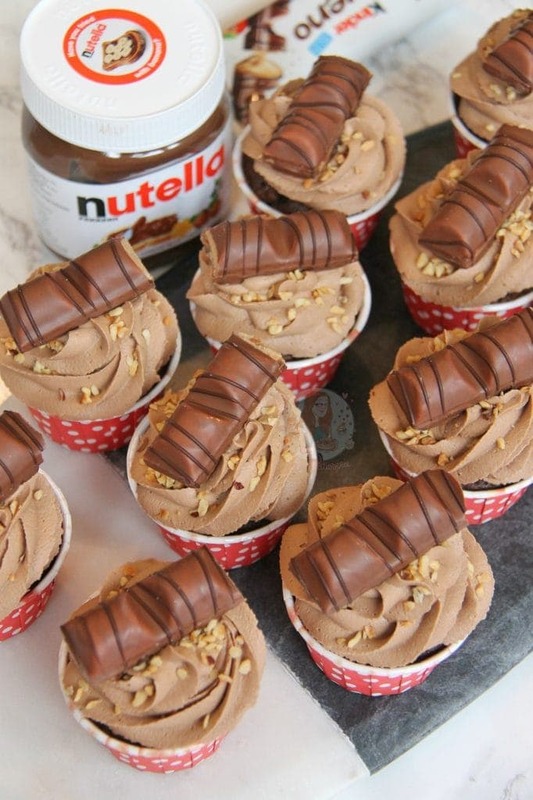 I would double the ingredients for the cupcake sponges and split between two tins, and then also double the frosting! Hi I wanted to know can the same recipe be used to make an 8 inch Nutella cake ? And it has Nutella ? 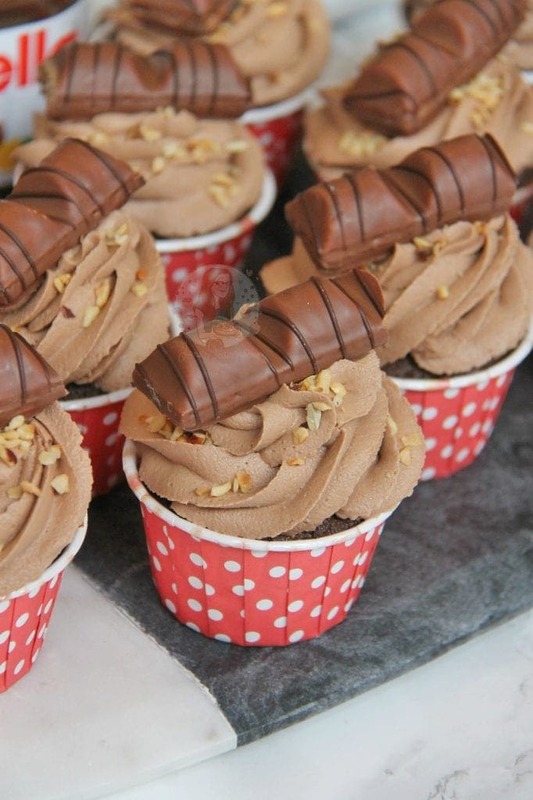 This looks a great way of making a regular chocolate cupcake even more desirable. I’ll be giving these a go soon! Thanks Andrew!! 🙂 Let me know how you get on!